Any waste that contains hazardous materials should be removed and disposed of professionally. Do-it-yourself home improvement projects have become increasingly popular these days, perhaps due to a combination of a slow economy that makes people eager to save money and an abundance of home improvement shows that give them the confidence to attempt projects on their own. Regardless of what type of project you may be doing, waste disposal is probably the most annoying part. Many people tend to overlook the question of waste disposal until they’ve already begun work and suddenly realize they need a place to stash their trash. This can be dangerous as well as inconvenient if any kind of hazardous material such as asbestos, mold, or lead paint dust is involved. Save yourself some time and hassle and be sure to plan waste disposal ahead of time. Here are 3 options to consider. If you are doing a very small project that will not generate a whole lot of waste, you might consider just using your regular garbage collection service to haul away the trash. However, be sure you check with your trash collector to find out what their requirements are. You may have to break items down into 4×4 foot pieces or bag all waste entirely for it to be accepted. For larger jobs, you could consider renting a bin or dumpster. In this case you will need to be sure that you either have space to place the dumpster on your property or a permit to place it in the street. Throwing items into a dumpster makes a great stress relief but it also generates dust as the pieces of wallboard, wood, roofing tile, etc. slam into one another. This makes it absolutely imperative not to use a dumpster to dispose of asbestos-containing materials, as you could be contaminating your entire neighborhood’s air with each toss. Throwing away lead paint covered items in this manner would also be ill-advised. If there is any possibility that your renovation job will involve disturbing hazardous materials like asbestos or lead paint, your best and safest option really is to use a professional remediation specialist for the entire job. H2 Environmental can help you determine if any hazardous materials will be impacted by your renovation with thorough lead and asbestos testing, and then pair you with qualified contractors for the job if needed. We will also make sure that any contaminated renovation waste is disposed of properly. 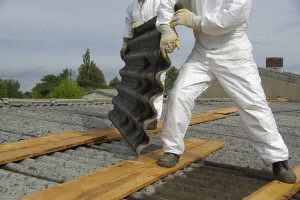 There are actually special requirements for disposing of asbestos because it has official hazmat status in California, and we will make sure proper disposal is included in the quote for your project.